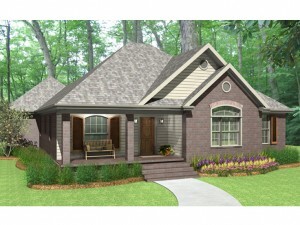 If you are looking for a family-friendly home plan with an economical design, consider this stylish ranch house plan. European details highlight the exterior while a covered front porch invites everyone inside. Beyond the entry you’ll find an efficient floor plan coupling the step-saver kitchen with the casual dining space making meal service a snap! Nearby, the comfortable great room handles family time and special holiday get-togethers with ease. A fireplace warms this gathering space on wintery nights while a rear porch and patio extend the living areas outdoors, perfect for nature lovers. Organization is at hand with the laundry room, planning desk and 2-car garage with storage teaming up at the back of the home. The right side of the house is dedicated to the sleeping zone where two family bedrooms are neatly arranged in front of the master bedroom. A hall bath accommodates the children’s needs. Your master bedroom enjoys a walk-in closet and deluxe bath outfitted with His and Her vanities and a soothing garden tub. Just right for families on a budget, this affordable home plan is worth taking a closer look. Browse more home plans like this one in our Small and Affordable House Plan collection.